Real Madrid are thought to be pursuing Sao Paulo defender Breno, with Robinho's agent Wagner Ribeiro involved in discussions with both clubs. 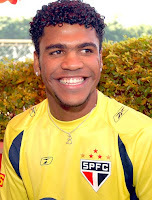 Breno, 18, currently has a buy-out clause of 15million Euros in his Sao Paulo contract, with Real Madrid keen to pay the fee in the January transfer window. However, Sao Paulo wish to keep hold of Breno for their Copa Libertadores campaign and would be more willing to part with the player next summer. The problem Sao Paulo face is that if Real Madrid pay the buy-out clause, then they effectively decide when Breno will join them. Sao Paulo are therefore keen for Breno to sign a new contract with a buy-out clause of 40million Euros to avoid him leaving the club in January. The negotiations are therefore very complicated, with Ribeiro brought in to try and find an amicable solution that will be agreeable for both sides.